Black White Modern Vintage Living Room A study in opposites, this black and white living room mixes both modern and vintage elements to create a stunning look. 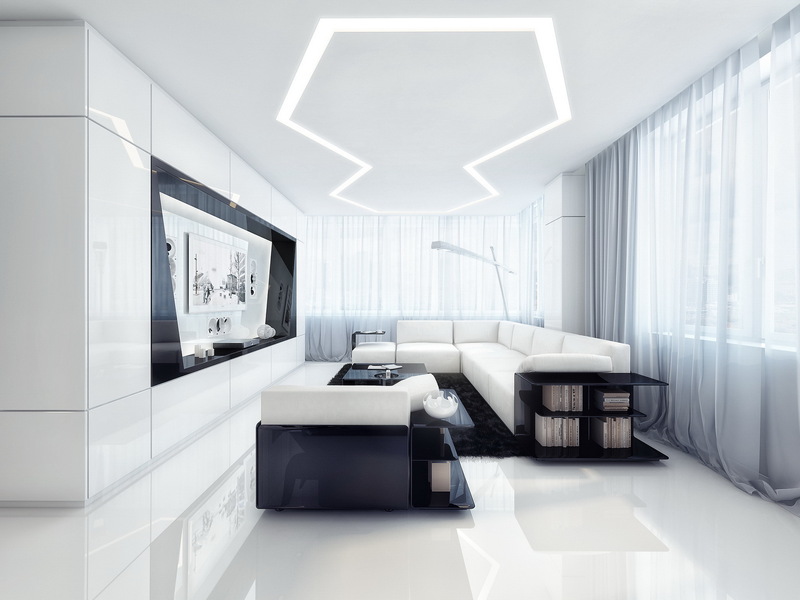 Stark black walls are the perfect backdrop for bright white furniture and coffee table. 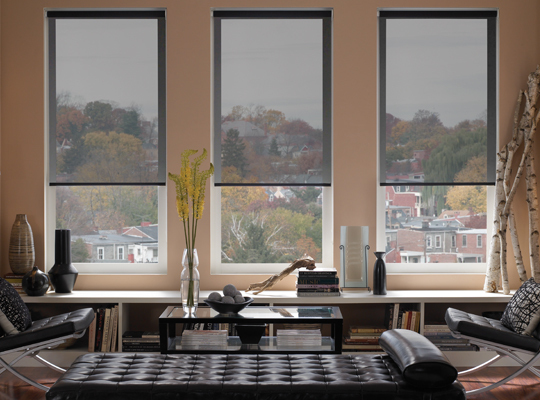 Window treatments combine black and white with sheer center panels and side drapery, keeping it both simple and soft. Designer Curtains and Top Treatments Living Room Nothing less than the most luxurious of window treatments will work in this glamorous living room. 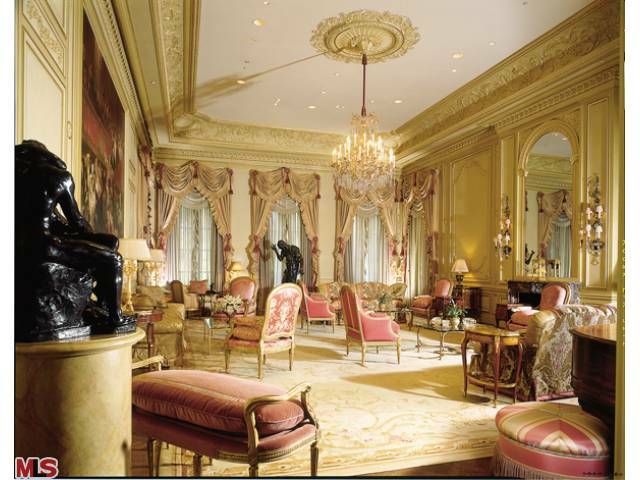 With its French provincial furnishings, Oriental rug, grand chandelier, and gold leaf accents, this room is undeniably impressive. 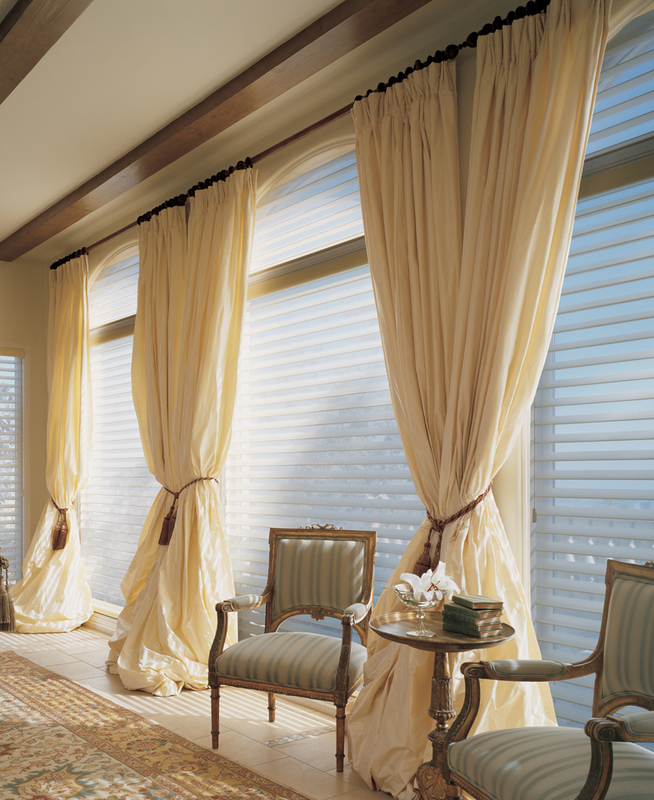 The custom designed window treatments with swags, jabots, sheer center panels, and more are the perfect finishing touch. Designer Screen Shades Living Room Elegant in its simplicity, the muted colors in this living room allow the scenery to take center stage. The translucent screen shades are the ideal complement to the room's décor and surrounding texture in the stone columns and sisal rug. In addition, they filter the incoming sunlight and never block the view. Pinch Pleat Drapes Decorative Hardware Living Room Graceful pinch pleat drapery highlight the tall ceilings and curved windows in this traditional yet cozy living room. The brown couches anchor the room while the decorative drapery hardware mounted at the ceiling line draws your eye upward. 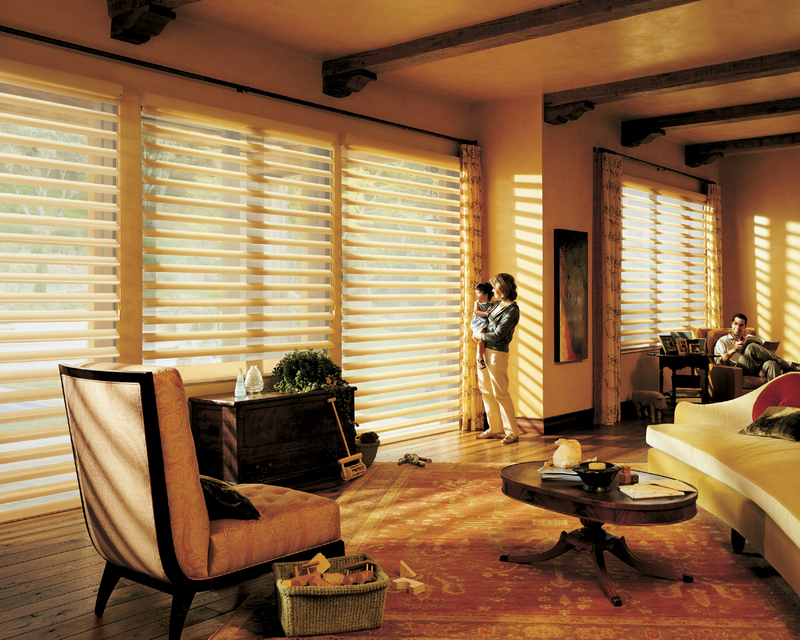 The long panels, which match the wall color, can be closed to filter sunlight or to offer privacy. Pirouettes Living Room Soft and simple, yet elegant in its design, Pirouette shades can be custom made to fit any size window. Choose a color to match your walls for a seamless blend all the way around the room. For added dimension and pattern, include a decorative rod and finials with colorful fabric side panels. 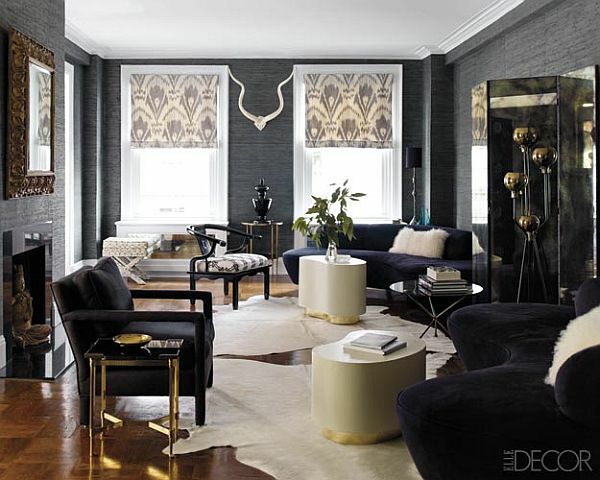 Roman Shades Living Room This contemporary living room shows off its sleek design and minimalistic aesthetic with black walls, solid-colored furniture, and simple accessories. White accent pieces like fluffy pillows, curved side tables, and rugs bring a touch of brightness. 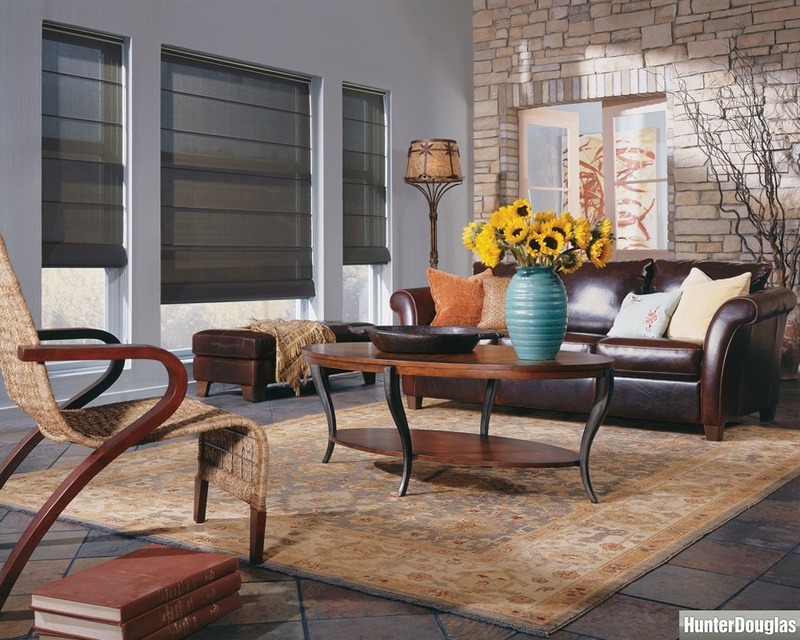 Black and white patterned fabric Roman shades break up the intense walls and give a soft finishing touch. Sheer Curtains Living Room Light and bright, this ultra modern and chic living room is wrapped in a cozy cocoon of soft, sheer curtains. The traverse rod hardware is mounted high along the ceiling line, which allows the white drapery panels to flow from the highest point of the room to pool on the floor. Silhouette Drapes Tassels Living Room Make a dramatic statement with custom made Silhouette window shades and luxuriously full drapery panels highlighting your penthouse view. Hung from traverse rods at the ceiling and gracefully pooling to the floor, add braided and tasseled dark tie backs to hold the side panels in place for the finishing touch. Silhouettes Living Room Bright and creamy white perfectly describes this contemporary and airy living room. Sleek, simple, modern furniture is offset by the softness of large Silhouette shades, furry rug, and the warmth of the oak floor. 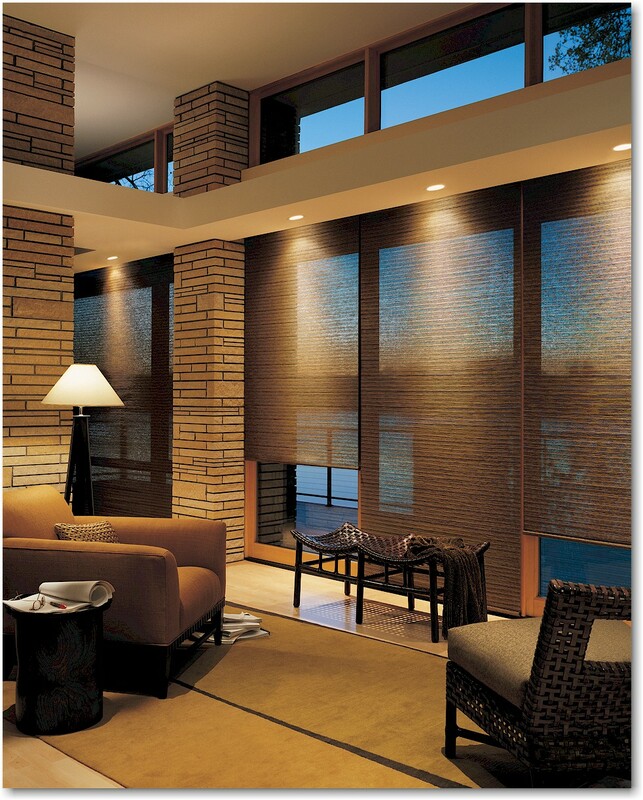 These shades can be maneuvered to filter the sunlight or opened to give you a completely unrestricted view. Solar Shades Living Room No matter how you try, these solar shades will never restrict your magnificent view. Whether open or completely closed, these sleek and elegant shades are translucent enough to see through, yet block damaging UV rays. Mounted inside the window frame, they will blend easily with both modern and traditional furnishings. 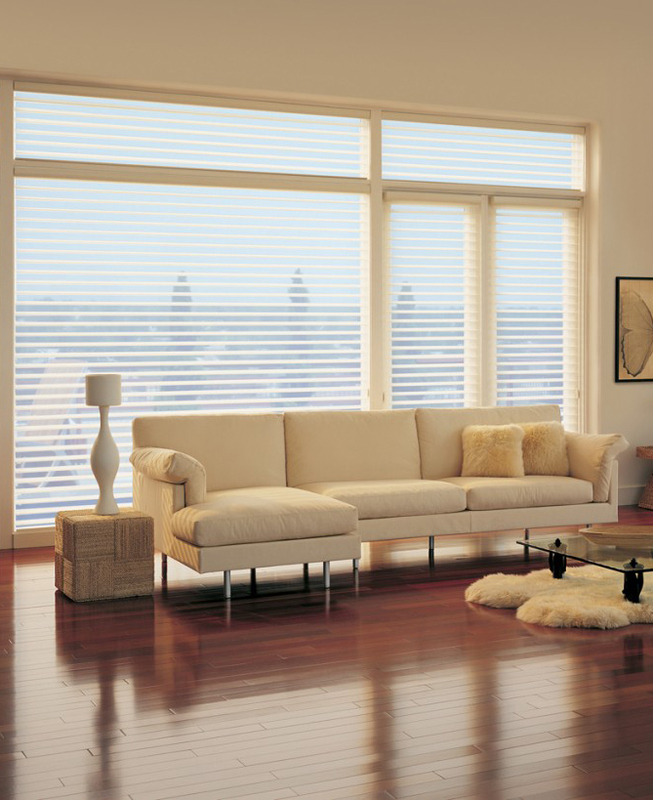 Solar Shades Roman Style Living Room In addition to all the great attributes of solar shades, these also bring the softness and style of Roman shades. 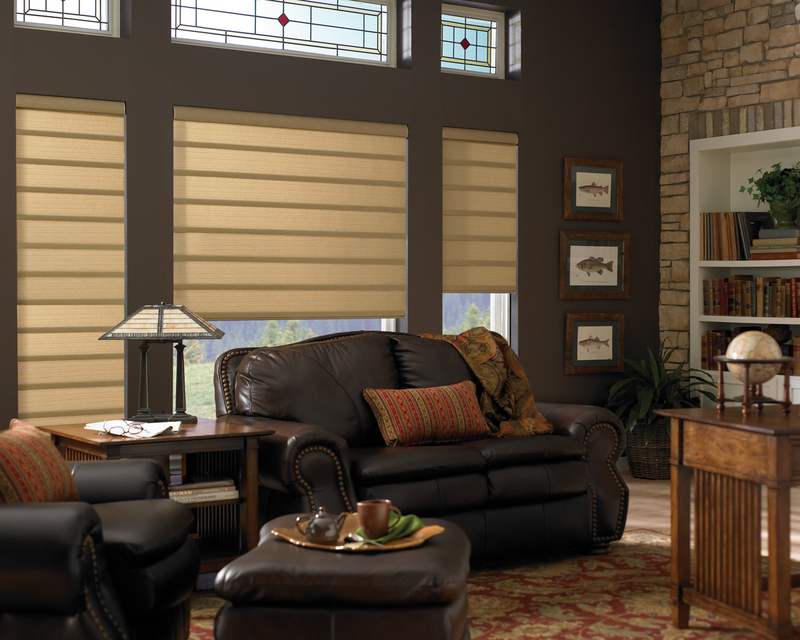 The pleats offer another texture to your window treatments without being too fussy or feminine. Installed alone or with a valance or panels, Roman shades work with both sleek modern furniture and something more traditional. Vignette Modern Roman Shades Living Room Leaving the traditional leaded glass transom windows uncovered, these modern Vignette tan colored Roman shades work perfectly with all the textures in this living room. With its dark oak arts and crafts tables, chocolate leather furniture, and minimal accessories, these Roman shades bring some softness to the room without being too feminine.